Enterprise Mobile App Design: Why it is Essential for Enterprises? Home Blog Enterprise App Design: Why it is Essential for Enterprises? A good designer makes good user interfaces for an enterprise app, design that is appealing aesthetically, is professional and useful, but an exceptional designer takes designing to the next level by creating an app that optimizes user experience. These designers don’t deliver apps that solve the purpose, but go beyond and deliver apps that are more intuitive, more functional and more seamless than conceived by the client. A common way of thinking is such that you just need to focus on functionality when designing and developing mobile apps, aesthetics and interface come much later in the picture. However, Enterprise app design is important in many ways. A good enterprise app design ensures good, seamless and easy navigation and experience for users. An Apple or Android developer making a commercial app or game wants his app to be attractive, intuitive and appealing, but an enterprise app developer focuses solely on functionality. True, they don’t have to worry about competing with other apps but if they don’t start considering enterprise users as consumers, the end result might not be as appealing or as intuitive as other apps. Moreover, these days Apple and a lot of mobile enterprise app development companies are improving their apps and targeting enterprises. This is because good developers have realized that enterprise users need to be given the best so as to maintain the image of the company. Besides, a great app will help them do their work faster, help them achieve a lot of things on the go, deliver results in time, help them remain positive through great performance, keep them loyal to the company and most importantly contribute significantly to the growth of the company. A simple and clear approach to enterprise app design ensures a functional, flawless and a fascinating app. Clarity of thought, purpose and design is very important while designing enterprise apps. Don’t add useless features or clutter your interface with buttons that will never be used. In short, keep it simple. One of the most difficult goals to achieve, but also one of the most useful is maintaining continuity in enterprise apps. For instance, a salesman opens some application, makes changes and additions in a file and then leaves the office, and starts using his mobile phone. This is where the continuity comes in picture; the application should start just at the same place where it was ended on the previous device. 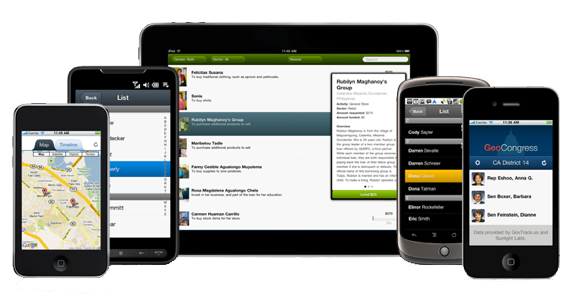 Enterprise apps should look consistent and similar across all platforms and devices. So when you are deciding enterprise app design also think of how it will work out when the user accesses the application over multiple mediums. A striking enterprise app design is considered as a design that works like the human brain. A wireframe or prototype of an app itself will suggest how good an app is going to be. At Rishabh Software we consistently strive for functional, beautiful and intuitive mobile application development by imbibing the core principles of enterprise app design.